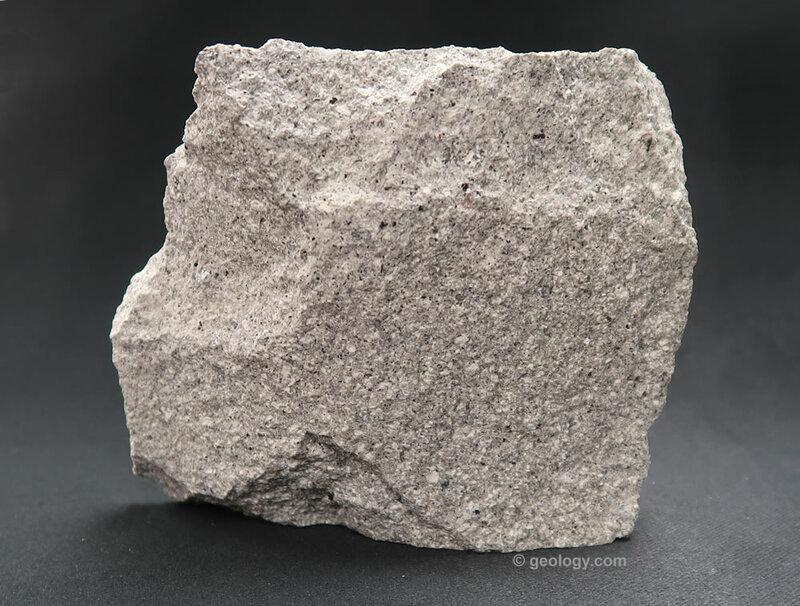 Dacite: An extrusive igneous rock of the continental crust. An extrusive igneous rock intermediate between rhyolite and andesite. Dacite: A piece of dacite from Mount General, San Bernardino County, California. This specimen is approximately four inches (ten centimeters) across. Click to enlarge. Dacite is a fine-grained igneous rock that is normally light in color. It is often porphyritic. Dacite is found in lava flows, lava domes, dikes, sills, and pyroclastic debris. It is a rock type usually found on continental crust above subduction zones, where a relatively young oceanic plate has melted below. QAPF Diagram for Dacite: A QAPF diagram is a method of classifying igneous rocks on the relative abundance of quartz, alkali feldspar, plagioclase feldspar, and feldspathoid minerals. The first letter of each of these minerals / mineral groups is the source of the "QAPF" name used for the diagram. Before plotting the composition of a rock on the diagram, the percentages of the QAPF minerals are recalculated so that their sum is 100%. Plotting the composition of a rock on the diagram allows a name to be assigned to the rock, and it also illustrates the composition of that rock type with many other igneous rock varieties. The diagram above is specific for fine-grained igneous rocks. More information about QAPF diagrams. A generalized mineral composition for dacite is intermediate between rhyolite and andesite. It usually contains more quartz than andesite and more plagioclase than rhyolite. The plagioclase feldspars are often oligoclase, andesine or labradorite. Dacite can be considered the fine-grained equivalent of granodiorite. Plagioclase is the most abundant mineral in many dacites. Other minerals that might be found in dacite include quartz, biotite, hornblende, augite, and enstatite. Dacites consisting mostly of plagioclase and quartz are usually light in color, often white to light gray. Those with abundant hornblende and biotite can be light gray to light brown. The darkest dacites usually contain abundant augite or enstatite. Subduction Zone Dacite: Dacite is found at Mount St. Helens and other Cascades volcanoes, where the relatively young Juan de Fuca plate is partially melted as it subducts below the North America plate. Image by the United States Geological Survey. Dacite magma generally develops in subduction zones were a relatively young oceanic plate is subducting under a continental plate. As the oceanic plate descends into the mantle, it undergoes partial melting with liberated water facilitating the melting of surrounding rocks. The subduction zone where the Juan de Fuca plate subducts under the North America plate is one location where dacite magmas have formed. Here the Juan de Fuca plate is relatively young when it subducts into the mantle. Geologically recent activity at Mount St. Helens has involved dacite and andesite magmas that have produced volcanic domes, lava, pyroclastic debris and volcanic ash. Dacite magma sometimes is involved with explosive eruptions. The magma is viscous and sometimes contains abundant gas, which can cause an explosive eruption when the magma reaches the surface. Viscous dacite magmas with little to no gas can extrude from a vent to produce thick lava flows or slowly build a steep volcanic dome atop of the vent. Dacite is sometimes used to produce crushed stone. It performs well as fill and as a loose aggregate in a wide variety of construction projects. It does not perform well as a concrete aggregate because its high silica content reacts with the cement. Dacite Projectile Point: Fine-grained dacite with a uniform texture can be knapped into small tools and weapons. This Native American projectile point was knapped from black dacite. Found in southeastern Montana. Approximately 7/8 inch long and 1/2 inch wide. Many specimens of dacite are fine-grained and of relatively uniform composition. Ancient people have knapped them into sharp tools and worked them into utilitarian objects. When knapped into projectile points, scrapers, and knife blades, they have an edge that is not as sharp as obsidian but is much more durable. Dacite Lava Flows on Mars: This image was produced using data collected by NASA's THEMIS spacecraft. The colors represent different rock types exposed at the surface on the flank of the Syrtis Major volcano. The magenta-colored areas represent dacite lava flows. The source of the dacite lava was the Nili Patera caldera visible in the southern portion of the lava flow. Small dacite flows can be seen in other parts of the image. The image width is about 10 miles (16 kilometers). Click to enlarge. 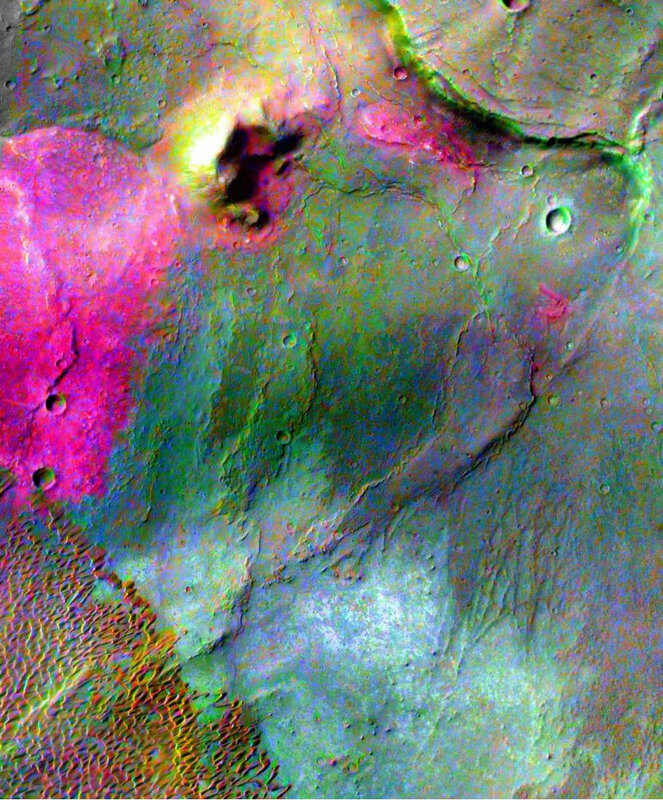 In 2002, NASA's THEMIS spacecraft began orbiting Mars, scanning the surface of the planet with a thermal emission imaging system. Instruments on the spacecraft had the ability to characterize the mineralogy of rock units exposed on the surface of Mars. Their goals were to identify the rock types on the surface of Mars and map their geographic distribution. THEMIS identified basalt as the primary volcanic rock exposed on the Martian surface. Syrtis Major is an 800 mile (1300 kilometer) wide basaltic volcano near the Martian equator. It has several collapse calderas at its summit and numerous volcanic vents on its flanks. The flank eruptions have produced a sequence of glassy, silica-rich dacite flows. These have built cones up to 1000 feet (300 meters) high, with lava flows that travelled up to 12 miles (20 kilometers) from their vents. Many of the volcanic rocks observed on Syrtis Major were dacites and obsidians, similar to terrestrial volcanoes such as Mount Hood in the United States and Mount Fuji in Japan. The existence of dacite on Mars is evidence that highly evolved magmas have formed on Mars, and they were created by processes such as partial melting and fractional crystallization.